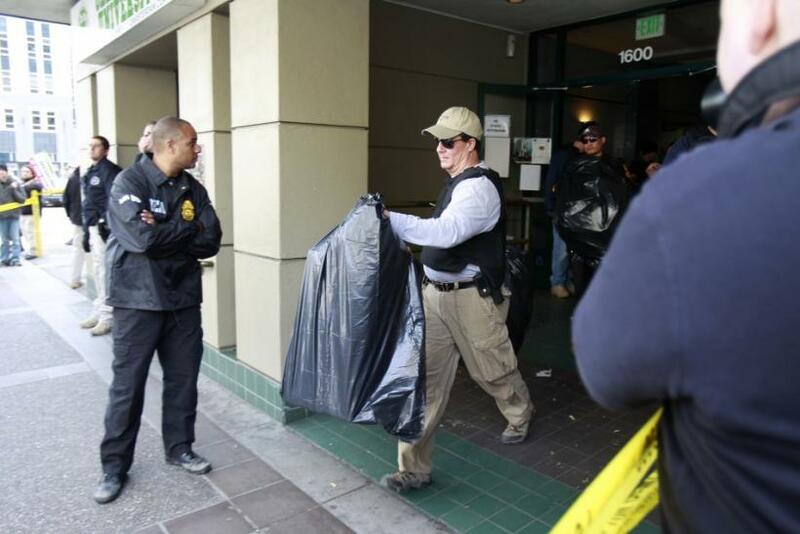 Monday's raids on a prominent Oakland medical marijuana advocate's businesses and properties underscored the federal-local divide over the legality and utility of cannabis. Armed federal agents from the Internal Revenue Service, Drug Enforcement Agency and the U.S. Marshals Service seized files and plants from a medical marijuana dispensary and from Oaksterdam University, a school established to train aspiring members of the medical marijuana industry. Both were founded by Richard Lee, a longtime advocate who was instrumental in supporting an unsuccessful 2010 ballot measure that would have legalized possessing small amounts marijuana for recreational use in California. The raid demonstrated the ongoing tension between the federal government and states / municipalities willing to permit some marijuana use. Medical marijuana is legal in California, and Oakland offered a glimpse of what broader legalization might look like by passing laws to tax and regulate dispensaries. But the federal Controlled Substances Act holds that cannabis is a dangerous drug with no medical value, ranking it alongside substances like heroin and mescaline. Federal prosecutors have launched a crackdown on the cultivation and sale of marijuana, saying many businesses are more concerned with profit than with helping patients, and warning Oakland not to allow large-scale growing. That has led advocates to accuse the Obama administration of reneging on an earlier promise to lay off providers who were complying with state laws. Oakland City Councilwoman Rebecca Kaplan told KTVU that Lee's influence in Oakland has been overwhelmingly positive and suggested the focus on cannabis was misplaced. My constituents' top priority is fighting gun violence and illegal guns, Kaplan said. A spokesperson for the Drug Enforcement Agency was unable to elaborate on the reason for Monday's raids, noting that the warrants for the operation were under seal. We can't really talk about any of the details pertaining to the search warrant other than that it happened, said DEA special agent Joycelyn Barnes. Was Federal Government Trying To Send A Message By Targeting Lee? But proponents of legalization believe that the government was sending a message by targeting Lee. I suspect that [Monday's] raid was because Richard Lee is so high profile, said William G. Panzer, a criminal defense lawyer specializing in cannabis cases who is on the board of the National Organization for the Reform of Marijuana Laws. The Obama administration has ramped this stuff over the last year, Panzer added, to the point they're worse than the Bush administration was. Some advocates echoed Kaplan's argument the raids represent a misuse of law enforcement resources. They argue that legally sanctioned and regulated marijuana dispensaries are far preferable to the alternative. One has the impression this is more about creating an impression of fear and intimidation in the medical marijuana world than it has to do with any serious enforcement of medical marijuana law, said Ethan Nadelmann, founder and executive director of the Drug Policy Alliance. These raids aren't going to reduce the availability of marijuana. All they're going to do is push the providers back into the black market and into the hands of people who are far more criminally minded. That critique was sharpened by the fact that, on the same day the raids unfolded, a 43-year-old nursing student named One L. Goh gunned down seven people at Oakland's Oikos University. I think the events of [Monday] really put things into perspective, Panzer said. We have a guy with a gun killing people, going berserk shooting people, and most of the cops are somewhere else going after a plant. It's unclear what role the IRS played in Monday's raid, but Nadelmann said the agency is increasingly deployed in the crackdown on cannabis. For example, the IRS invoked a Reagan-era section of the tax code in 2011 to rule that dispensaries cannot deduct business expenses like payroll and rent. Given the fact [the dispensaries] are operating legally under state law but the federal law regards them as illegal, they're always vulnerable to the IRS saying they didn't dot this 'I' or cross this 'T,' Nadelmann said. I think it's one of the more insidious aspects of this federal assault on medical marijuana dispensaries acting legally under state law.